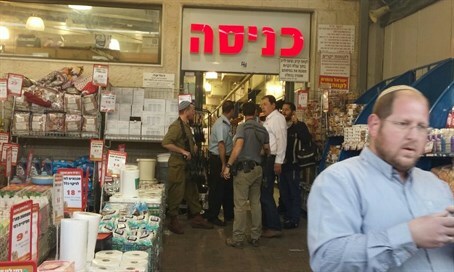 Security cameras capture two 14-year-old Arabs walking freely for 20 minutes in store before launching lethal stabbing. Video from the security cameras at a Rami Levy supermarket in Sha'ar Binyamin captured the two 14-year-old Arab terrorists who stabbed 21-year-old Sergeant Tuvia Yanai Weissman to death Thursday, and moderately wounded another 36-year-old shopper. The video shows the two terrorists from nearby Bitunia walking around the store hunting for a victim. An initial investigation has revealed the two got past security at the store with knives they brought from home, and then were able to walk around freely for a full 20 minutes before launching their stabbing attack. They were shot by two armed civilians in the store and arrested; the terrorists were brought in for treatment at Hadassah Mount Scopus Hospital. Rami Levy was summoned for questioning to be conducted on Sunday by the police regarding the incident. Weissman, a combat soldier in the Nahal Brigade, leaves behind his wife Yael, a four-month-old daughter, his parents and three brothers. His funeral will take place on Friday at 8 a.m. at the Har Herzl military cemetery in Jerusalem.